Never mind the headline, Farah Mendlesohn’s new book is obviously keeping these cats awake! 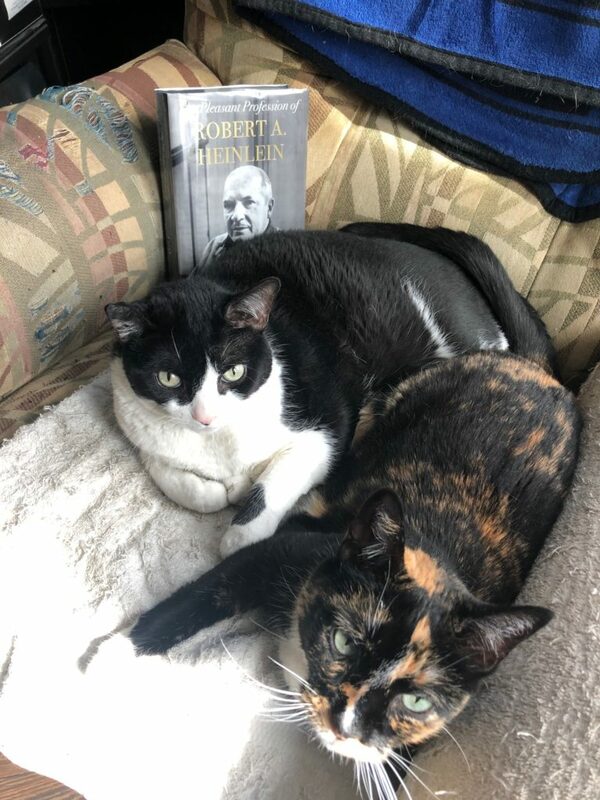 This entry was posted in Cats Sleep on SFF and tagged Michael J. Walsh, Robert Heinlein by Mike Glyer. Bookmark the permalink. And then they walked through the wall. … carrying a full report of the weirdo pointing something clicky at them — how long will it be before cat-posters of Mikey are seen (by cats only, of course) all over the city? Scooter Cat is, clearly, how you get away from Danger Cat. Never trust a Tortie! Torties: the walking implementation of a randomness generator. The cats seem to love each other. Mine is unfortunatly not happy about the presence of any other cat. One of mine is only barely a tortie – you have to look close to see most of her orange.